For the first time since 2011, the Mardukite Truth Seeker Press is proud to offer the “Babylonian Magick” special arrangement Limited Edition Hardcover Grimoires — limited to ONLY 50 copies printed, numbered and signed by editor Joshua Free! THIS IS A LIMITED TIME SENSITIVE OFFER!!! PRE-ORDER SPECIAL ARRANGEMENT ITEM ONLY!!! BABYLONIAN MAGICK — A Grimoire of the Rites & Rituals of the Mardukite Anunnaki Tradition, first appeared in paperback as the 2012 Ceremonial Edition of “Mardukite Magick“ and is now being reissued by the Mardukite Truth Seeker Press in a special hardcover limited edition printing to commemorate the 5th Anniversary of the 2009 Beltane Mardukite Stargate ceremonial observance. ONLY 50 COPIES of this limited edition numbered and signed hardcover grimoire will be made available to the public and Mardukite Chamberlains alike during this limited time offering! Previous limited edition numbered hardcover editions of Mardukite Necronomicon publications have now been found selling for over $1500 online and on eBay! Don’t miss out on this incredible opportunity and investment into the Modern Mardukite Anunnaki Legacy! Babylonian Magick — Mardukite Anunnaki Necronomicon Spellbooks by Joshua Free Return! Highly sought after “Necronomicon Spellbook” heritage editions of Joshua Free’s underground bestselling Mardukite 2011 (Year-3) ‘Necronomicon Workbook’ and ‘Mesopotamian Magic’ cycle of materials returns in print and available to the public! The Necronomicon Spellbook Trilogy combines to form a masterpiece archival library collection of mystical exploration into the heart of the ancient Mesopotamian Mysteries, this complete practical companion to the Mardukite “Necronomicon Anunnaki Cycle” illuminates the revolutionary teachings and source materials of the Modern Sumerian-Babylonian-Anunnaki Tradition of the Mardukite Chamberlains (Ordo Nabu Maerdechai), edited by Joshua Free, the presiding Nabu of the organization since its inception. The Magan Text… The Enuma Elis… Long thought to be the fantastic concoction of wishful-thinkers, the fundamental basis for the mystical, magical and spiritual tradition born of Ancient Mesopotamia has come to life! Cuneiform tablet records of magick and creation are drawn together to reconstruct the most antiquated, powerful and legendary “magician’s primer” ever known to the minds of men — formulated by the ancient Sumerians and Babylonians! 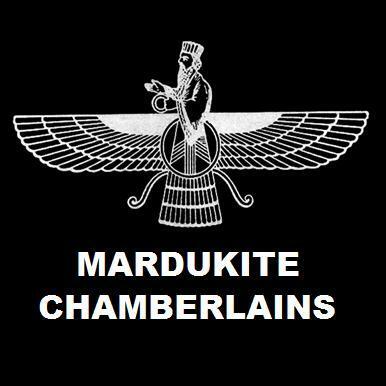 The Maqlu Tablets… An authentic “Necronomicon Spellbook” of Mesopotamian Magick drawn from the sands of Babylonia — as known to the Sumerians then reinvented in Babylon — forming a complete Anunnaki (‘alien sky god’) “grimoire” — a complete handbook dedicated to Enki, Marduk and Samas (Shammash) and used by magicians and priests for thousands of years to combat in wizards’ duels, reverse the effects of evil spells and curses, banish disease and nightmares, and conjure the protection and blessings of the gods! To the Beyond… By whatever names it has been given, the part of this ‘advanced’, ‘esoteric’ or ‘inner circle’ work connected directly to the “Other”, in whatever tradition it is realized from, is the highest part of the ‘Great Work’ – that which all the rest seemingly culminates into or points toward. It has been considered ‘divine communication’ by some and ‘trafficking with the devil’ to others – but regardless of the view taken, the knowledge and experience of these crossings is never held without some regard, for better or worse! In 2009, the Mardukite Chamberlains began releasing their underground publications as part of an extraordinarily extensive version of what many people’s debut into the realm of Mesopotamian esoterica had been – the NECRONOMICON. The newly re-released nostalgia editions of the Year-3 “Necronomicon Spellbook” series make an excellent compliment to the 2009 nostalgia edition reissues of the original Year-1 “Necronomicon Anunnaki Bible” cycle of materials also available from the Mardukite Truth Seeker Press. The original versions of the 2009 ‘Mardukite Core’ were all elaborately designed limited edition handcrafted tomes that later only appeared in the consolidated anthology titled ‘Necronomicon Anunnaki Bible’. It consisted of the ‘Necronomicon (of Joshua Free)’ (Liber-N) in June of 2009 and three subsequent titles, ‘Necronomicon Liturgy & Lore’ (Liber-L), the ‘Necronomicon Gatekeeper’s Grimoire’ (Liber-G) and the ‘Nine Gates of the Kingdom of Shadows’ or ‘Necronomicon Shadows’ (Liber-9).